This book provides good study materials for university subjects that involve shipping and international trade. 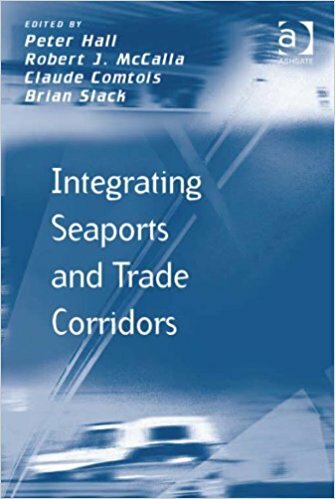 The book collects 15 academic research papers to unravel how the process of integrating seaport gateways and trade corridors can benefit maritime trade and port city-regions. These papers also investigate the strategies on integrating seaports and trade corridors under the context of global economic recession and trade downturn. Their findings show that good integration would generate economic benefits and maximize traffic volumes. The key action verb of this book is ‘‘integrating.’’ Integration is a term which carries different meanings to different users. This book collects Robert J. McCalla (a Canadian geography professor)’s paper which entitled Perspectives on Integrated Container Transport: The Canadian Example. McCalla illustrates that the term ‘‘integration’’ carries different meanings to different users. For port planners, integration can help to formulate consistency across different policy concerns, such as land use and environmental regulations. For economists, vertical integration along the value chains will be analyzed differently with horizontal integration across market participants in the same sector. For researchers of globalization, integration refers to the blurring of national boundaries, a process that produces greater flows of people, goods, wealth, and information. This Part collects five papers that devote to the role of ports and trade corridors under the context of global economic change. This Part too discusses the question: Why the fortunes of ports were so deeply embedded in the global economy? The authors looked at such relationship both in terms of throughput, and in terms of the impacts from financial sector. The authors conducted the analysis using the data of 50 years (1955 to 2008) on international seaborne trade and their relationship to the exports of goods in the same period. The paper collected in Chapter 3 shows that under the new context of world trade, the only certain pattern is one of economic uncertainty. The authors concluded that one cannot expect the patterns of future trade growth will replicate those of the past. The authors further pointed out that researchers should pay more attention on the emerging patterns of trade, which was affected by the results of the strategies adopted by the powerful actors. Chapter 4 addresses the physical connection between the port and its hinterland. The authors investigated the relationship between behaviors of shipping lines and their preferential access to gateways. To uncover the pattern of the relationship, the authors calculated the Gini Coefficient on port concentration, in terms of maritime ranges, of various carriers, such as Maersk, CMA-CGM, and Evergreen. Trans-shipment and added value logistics. The authors conducted a matrix analysis on ‘‘port without logistics’’ and ‘‘port with logistics’’, and linking the analysis to ‘‘transshipment hub’’ and ‘‘gateway port’’. The research is worthy to undertake because previous economic researchers observed that trade activities tend to decline more rapidly than the overall economic activities during the stage of global recession. There are various interesting explanation that is presented in this book related to the “Measuring and improving the gateway and corridor performance” and “International case studies” that you can read in detail in the IPC Library. This book could trigger readers’ interest to explore the possibility of healthy integration of seaports and trade corridors to the larger arena of supply chain, which will help to promote international trading activities from today to beyond tomorrow. Integrating Seaports and Trade Corridors will help its readers acquire a real understanding of various significant integration issues related to seaports and trade corridors.